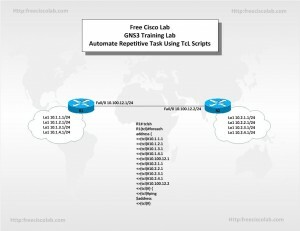 The Tcl shell can be used to run Cisco IOS CLI EXEC commands within a Tcl script. Using the Tcl shell to run CLI commands allows users to to automate repetitive tasks, and to create custom output for show commands. a. Open a text editor and create a new text file. Using a text file saves time, especially if you are pasting the Tcl script into multiple devices. b. Start with the tclsh command to enter Tcl shell mode in which you can use native Tcl instructions like foreach or issue EXEC mode commands. You can also access configuration mode from within the Tcl shell and issue configuration commands from their respective menus, although these features are not explored in this lab. c. Begin a loop using the foreach instruction. The loop iterates over a sequence of values, executing a defined sequence of instructions once for each value. Think of it as “for each value in Values, do each instruction in Instructions.” For each iteration of the loop, $identifier reflects the current value in Values. The foreach instruction uses the following model. d. To create a Tcl script that pings every IP address in the topology, enter each IP address in the value list. Issue the ping $address command as the only instruction in the instruction list. e. Enter Tcl mode with the tclsh command, and copy the Tcl script from the text file and paste it into R1. Note: You might need to press Enter to execute the script. g. Exit Tcl mode using the tclquit command on each device. Note: You can also use the exit command to exit Tcl mode. The creation of Tcl scripts takes a little extra time initially but can save considerable time during testing each time the script is executed. Use Tcl scripts to verify all your configurations in this course. If you verify your work, both academically and in production networks, you will gain knowledge and save time in troubleshooting.